Wash well and soak the rice for 30 mins. Shallow fry the onions in ghee/oil and set aside, or can deep fry or can use store bought fried onions. In 6 cups of water, add half of the Raw Masalas, pinch of salt, Half of mint leaves, 2 spoons of ghee/oil. Bring it to a nice boil. Add the rice, cover cook (Hardly 5-10 minutes) and immediately drain once rice is 85-90% cooked. Add saffron to it, if available. Set aside. In 2-3 spoons of ghee/oil, saute the ginger, garlic, raw masalas, onions. Add the chopped vegetables. Once partly cooked, add remaining mint leaves. cover and cook till 75-80 % done. Add required amount of salt, Biriyani masala. Finally add curd, and give a good mix. In a wide baking dish, layer the vegetable masala,sprinkle the nuts and then a layer of cooked rice, one on top to form 2-3 layers of each. Cover with foil paper and bake at 350' for about 25-40 minutes. Remove, give a good mix and serve with raitha. 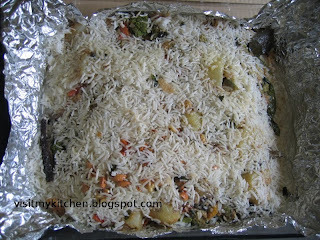 What a wonderful layered biriyani. Am sure it tastes so good. The curd gives it that extra butterlicious flavour. 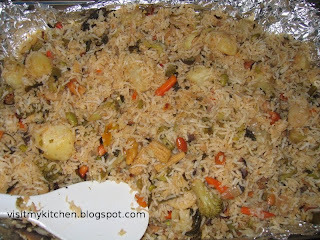 i make this regularly..have it in my blog..yours look yumm..
love the idea of using mints leaves in biryani..bookmarking.